Hemingway and Faulkner, Faulkner and Hemingway…. The American literary canon has expanded so much in the past thirty years or so that it almost spans the globe, like American business, drawing in writers from every possible corner. With greater inclusion comes the passing out of fashion of many a former icon (does anyone read Dreiser or Dos Passos anymore?). And yet, no matter how much critical tastes and scholarly measures change, it seems we’ll never be able to do without our Hemingway and Faulkner. Perhaps it’s their deep takes on history—Hemingway’s sentimental war correspondence and tragic sense of a changing Europe; Faulkner’s sense of a South held in thrall to squalid delusions of grandeur and epic colonial violence. Geopolitically relevant they still may be, but there’s much more to both than geopolitics. Perhaps it’s the timeless stylistic dialectic, or the Nobels, or the traded insults, or that the names themselves, like Roosevelt and Kennedy, trigger instant recall of the “American century.” Of course, devotees of Faulkner (I am one), of Hemingway, or of Faulkner and Hemingway need no rationale, and it is to such people principally that today’s post is addressed. 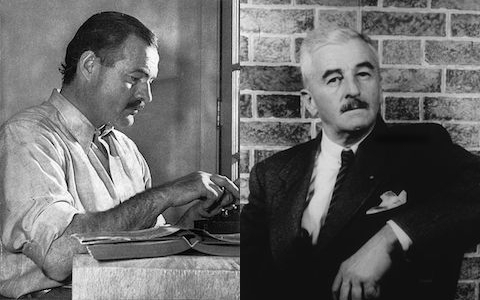 For today, we bring you Hemingway and Faulkner, reading Hemingway and Faulkner. In the Spotify playlists above (download Spotify here), we have both authors reading from their Nobel acceptance speeches, then excerpts from their literary works. These recordings were originally released as vinyl albums by Caedmon Records, that pre-audiobook phenomenon founded by Barbara Holdridge and Marianne Roney in 1952. Caedmon released albums of readings by dozens of major writers, like Dylan Thomas and Eudora Welty, and we have featured many of them here before—such as those from T.S. Eliot, Sylvia Plath, W.H. Auden, and Tennessee Williams (reading Hart Crane). But today, it’s Hemingway and Faulkner, who despite—or because of—their differences, belong together forever as great American literary patriarchs, even if patriarchy is terminally passé. If you need the Spotify software, please download it here. Sad that in order to hear these wonderful recordings I have to sign up for Spotify (where they get all your information transferred to them). Apparently that’s the price. Sorry I don’t wish to do that. I’ll look elsewhere. The same info you just gave to this website for your comment. Tighten up your tin foil hat buddy. Spotify can screw itself. It’s a kim dot com deal where you sign up and your money goes to some fat-backed Swedish creep and the actual creator still get ripped off. Is there someplace we could hear this without signing up for some unknown thing first? I’d really like to hear it…. Spotify is not an “unknown thing.” Not only is it the most effortless and sensible way to legally listen to music online, it’s also ubiquitous. To not be willing to “sign up” (which to even call it that makes it sound so much more of a hassle than it is) is to do a disservice to yourself. Also, did this poster try to find every possible means of repeating the writer’s names as a joke? Reading this was arduous.